Through 19 action-packed NHL seasons, Mike Gartner established himself as the model of consistency, scoring 708 goals and adding 627 assists for 1,335 points in 1,432 regular season games. Add 27 goals and 25 assists collected as an 18-year-old in the WHA and you have a career that is that much more sensational. Seven appearances in NHL All-Star Games attest to Gartner's status within the game. But there is one thing that eluded him: "Unfortunately, I wasn't able to be on a Stanley Cup-winning team," he sighs. "But the longer I played, the more I realized how difficult it is to be part of a group like that." Mildly disappointed but not dismayed, Mike cites his career pinnacle as playing for his country. "On eight different occasions, I got to play for Team Canada in Canada Cups, World Championships and with the Team Canada juniors," he states. "In 1984 and 1987, I was part of those teams that won the Canada Cup, and to say I was part of the best hockey team in the world at that time, was and is, a point of pride for me." 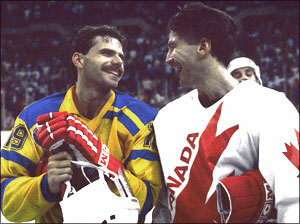 To hockey aficionados, the 1987 Canada Cup tournament provided the finest hockey ever played. 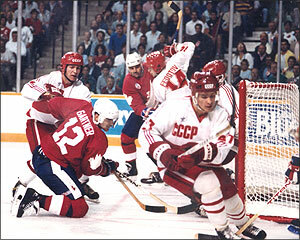 Team Canada, featuring Mike Gartner, Wayne Gretzky, Paul Coffey, Grant Fuhr and Mario Lemieux, finished first in the round robin, while a Soviet squad that included Viacheslav Fetisov and Sergei Makarov finished second. Sweden finished third and the Czechs fourth. The anticipated but exciting championship between Team Canada and the Soviets was staged when the Soviets defeated Sweden and Canada dumped the Czechs. Each game of the best-of-three series finished with an identical 6-5 score. Game 1 was an overtime thriller in Montreal that saw the Soviets skate away with the victory. Game 2, played in Hamilton, went to double-overtime before it was decided by a Mario Lemieux marker. Tied at five late in the third period of the championship game on September 15, 1987, it appeared as though overtime would decide the Canada Cup champion. 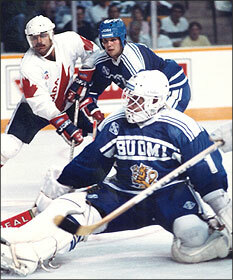 In the Canadian zone, Dale Hawerchuk won the faceoff from Valeri Kamensky, allowing Lemieux to pick up the puck. Mario passed to Gretzky at the blueline, who crossed centre ice with Lemieux and Larry Murphy trailing. Gretzky fed the puck back to Mario, who fired a bullet to the top corner behind Soviet netminder Sergei Mylnikov. Although it was now 6-5 for Canada, there was still 1:26 to play. Canada was able to let time evaporate, giving Team Canada the Canada Cup championship! Mario Lemieux scored a tournament-best 11 goals, including four game-winners, in 9 games. Wayne Gretzky led all series participants in scoring, recording 3 goals and 18 assists for 21 points. Mike Gartner scored 2 goals and added 2 assists in 9 games for Canada. "I think 1987 was the greatest hockey I've been part of," Gartner says, "And to say I was part of that is special." Kevin Shea is the Editor, Publications and On-Line Features, at the Hockey Hall of Fame.